Classic Les Paul Style: The Les Paul Studio LT has everything new players need to get that one-of-a-kind Les Paul sound without breaking the bank. The all-Mahogany body has a carved top and is slightly lighter and slimmer than full-size Les Pauls so it’s easy to hold for long practices and gigs. The bolt-on Mahogany neck has a “Les Paul” scale length of 24.75” with a 1.68” nut, a 2-way adjustable truss rod for a perfect setup, a Rosewood fingerboard with pearloid dot inlays, and a smooth tapered neck joint for easy reach to upper frets. 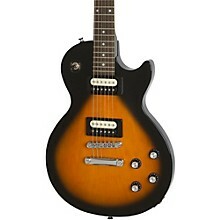 The Les Paul Studio LT is available in Ebony, Heritage Cherry Sunburst, Vintage Sunburst, and Walnut color finishes. Zebra Coil Humbuckers: The Les Paul Studio LT’s classic “Les Paul” power comes from two Zebra Coil Ceramic Humbuckers. Owners of vintage Les Pauls often remove their pickup covers for a better bass response and magnetic pull, revealing the black & white (“zebra”) bobbins underneath. Ceramic pickups have a higher output than vintage Alnico magnet pickups and are designed to provide a tight low-end response with both a smooth mid-range and a slightly more pronounced top end tone. Ceramic magnets have been a favorite of metal and hard rock guitarists for decades. The Les Paul Studio LT has a 650R in the rhythm position and a 700T in the lead position. 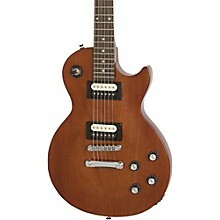 Controls include volume and tone for each pickup and an all-metal 3-way pickup selector. 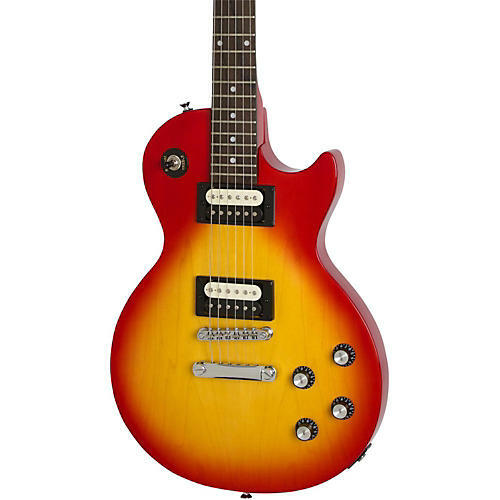 Rock Solid Epiphone Hardware: The Les Paul Studio LT features Epiphone-designed rock solid all-nickel hardware including the classic Les Paul bridge combo of a LockTone Tune-o-matic bridge and Stopbar tailpiece, a non-rotating ¼” output jack, and premium die-cast 14:1 ratio machine heads. An optional case is also available. Grab this affordable rocker. Order today.